Description: A Bryce Sphere transformed into a Dodecahedron. All work done in Bryce including design and construction of Lens Systems to produce a spherical map. 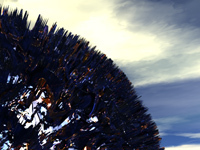 Micro Displacement Map Modelling [MDMM] is used here to create the Macro-form of the Object. 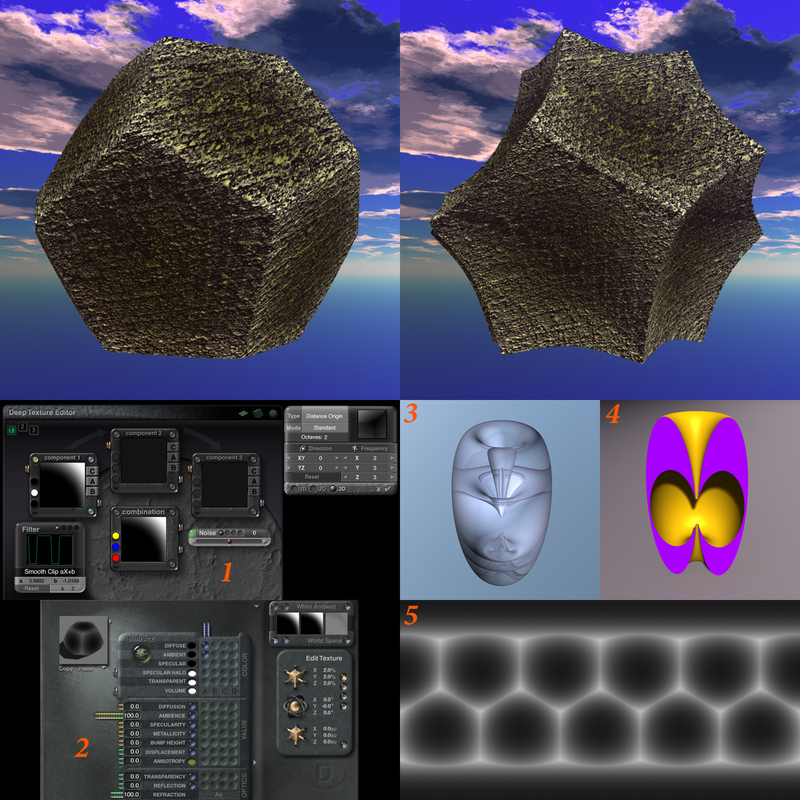 Bump Mapping is used to create the Surface Micro-form of the Object. However usually MDMM is used to create the Surface Micro-form of an Object which is already Macro-formed by another means [such as in the DMML = "Terrain Editor"]. Here i am doing it differently! See also the cube example in the centre of my first post on this subject http://www.bryce5.com/details.php?image_id=5352 [that was a different approach to what i am doing here]. What that really means is that you can have 3 levels of real 3D detail !!! 2 levels created in the DMML and one using MDMM. If you also add Bump you can have 4 independent levels! Therefore very elaborate Landscape surfaces can be made which have real 3D textures at several different frequencies. I have not experimented with the curvature filter yet for this application which could be used also. There are two versions shown above - both with Micro Polygons set to 0.005 [the maximum you can use]. The one [on the left] used 33% Displacement and the other [on the right] 100% Displacement. You can see how the Macro-form of the object changes with the Displacement value used. Of course the Grey-scale gradient used for the map driving the effect also influences this result. 2.) Build a Dodecahedron with 12 of those. Same as you would do if you were to make a folded paper model. 3.) Place the Object Centre of the Dodecahedron at World Centre. The Object Centre is were the 6 Centre Angle Vectors [CAVs] cross each other. A CAV is a line that runs from one corner (vertex) through the object centre to the opposite CORNER (vertex) [except for the Tetrahedron were it runs through the geometric centre of the opposite FACE]. Note that this Object Centre is not always coincident with the bounding box centre [it depends of which Polyhedron Type you are using and also on its orientation]! Fortunately for the Dodecahedron you don't have to worry about this because the bounding box looking down the Y-axis is a square. The Dodecahedron fits perfectly into a cube. 4.) Set up for Bryce Ambient Painter. Turn off the Sky and set all colour boxes except Ambient to Black. Ambient should be White. Camera at World Centre looking down the Z-axis. 5.) Make a Black and White material in MatLab and DTE using the Distant Origin Noise. Use World space and adjust the Material using filters etc., so it looks something like Inserts 1 and 2. This will behave like a distance render but has many advantages because you can fully adjust the grey-scale range between the In-Sphere and the Out-Sphere of the object. Also you can use BOIP engines with it. The In-Sphere is a Sphere that touches the centre of every FACE of a regular Polyhedron. The Out-Sphere touches all the CORNERS. 6.) Design and make a Toroidal Lens System [TLS]. I refer to this species of BOIP engine as Panorama to Spherical Map Transformer [ PSMT ]. There are several possible designs [some better than others as far as distortion goes]. Inserts 3 to 4 show one of my early designs. This project actually uses a different and more recent design which produces less distortion than the one shown. But my old ones would have done this job perfectly well. 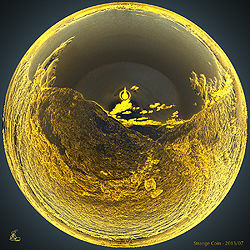 A TLS transforms a Panorama Render into a 2:1 ratio Spherical Map. If you don't want any nasty internal reflections then use a Refractive index of less than 100 for your design [I used 67]. Since designing and calibrating a TLS is very exacting and time consuming work [not to mention the special calibration objects you must build], you can buy a product that David and Horo have made to do this for you. I have not purchased it [ i am poor - no money - but rich in ideas], but suspect that David and Horo's implementation has less distortion than mine, but i am happy with my own creation because it does what i want it to do and i also like undertaking challenging projects. 7.) Place the TLS at World Centre. 8.) Then set everything up for a render of the Ambient Output only. You should end up with a map looking something like Insert 5. I rendered 1024 x 512 and saved as 24 Bit TIFF Export. 9.) Create a new scene with a normal sky and lighting. Create a Sphere and in the MatLab use a Picture Material and load this Map. Test render it with Spherical Mapping Mode for the Ambient and Diffuse outputs. 10.) Make sure it looks right as Ambient and Diffuse before you engage the Displacement. 11.) Always save for every edit before you render. When you load a file which has not rendered or only partly rendered stop the automatic render start immediately. Then start a new render. If you get a crash then get out of Bryce and start Bryce again and reload the file. If that does not work reduce the priority to low. I have had a few crashes during this project but i have always been able to overcome them and get a complete render. I have very little time so i had to design and run through this project away from my computer in my head. Often at night when i sleep. I must be a very unusual person who does this! Then later (tonight) when i had a couple of free hours i was able to execute the project on the computer with Bryce very quickly and it turned out exactly as i expected (imagined). Sometimes i am not so lucky and unexpected things happen. But that is good also, because then i learn something new. Very interesting! You've managed to use displacement. Hopefully, I'll get some spare time to experiment with this. Thanks for sharing your insights! Amaaaaaaaazing. I am in awe. Gotto go check this out for myself!